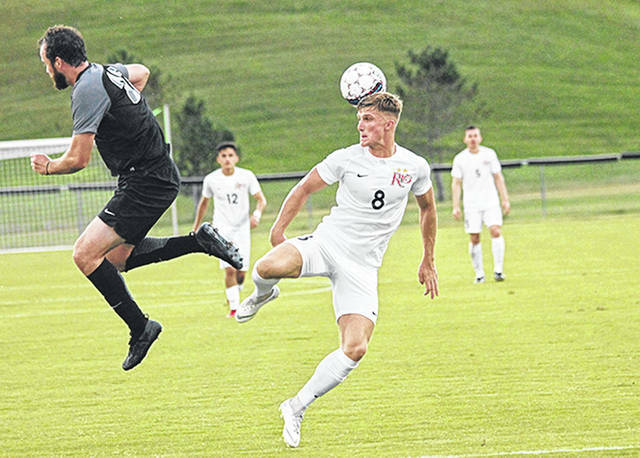 Rio Grande’s Harry Reilly had a goal and two assists in Saturday night’s 7-0 win over Concordia University at Evan E. Davis Field in Rio Grande, Ohio. RIO GRANDE, Ohio — Nicolas Cam Orellana scored a pair of goals, while Raimundo Cabello scored twice and assisted on another marker to lead the University of Rio Grande in a 7-0 shellacking of Concordia (Mich.) University, Saturday night, in non-conference men’s soccer action at Evan E. Davis Field. Harry Reilly added a goal and two assists and James Williamson also had a pair of assists for the eighth-ranked RedStorm, who improved to 5-0 overall with their fourth shutout of the season. The Cardinals, a member of the NAIA’s Wolverine-Hoosier Athletic Conference, lost for the fifth time in seven outings. Rio Grande blitzed the visitors from the outset, piling up a 38-4 edge in shots overall and a 19-1 advantage in shots on goal. Reilly, a senior from Coventry, England, was directly involved in each of the first three goals for the RedStorm, who built a 4-0 lead by halftime. Reilly scored off of a dual assist by sophomore Ewan McLauchlan (Aroch, Scotland) and Williamson – a junior from San Jose, Costa Rica – just 2:17 into the match to give Rio what proved to be all the offense it would neede. Reilly assisted on goals by Cam Orellana and senior Ben Mendoza (Chichester, England) at the 20:43 and 34:27 marks, respectively, and Cabello – a sophomore from Santiago, Chile – tacked on an unassisted marker with 2:20 remaining before the intermission to give the RedStorm its commanding lead at the break. Cam Orellana, a freshman from Santiago, Chile, scored off an assist by Williamson exactly five minutes into the second stanza, while Cabello scored off an assist by sophomore Samuel Pederson (Aldershot, England) with 14:15 left in the match to make it 6-0. Pederson scored the final goal of the night with 7:11 remaining thanks to an assist by Cabello. Junior Richard Dearle (Castle Donington, England) recorded one save in goal for the RedStorm. Spencer Ward was credited with 10 saves in a losing cause for the Cardinals. Rio Grande returns to action next Thursday, hosting Indiana University East in its River States Conference opener.